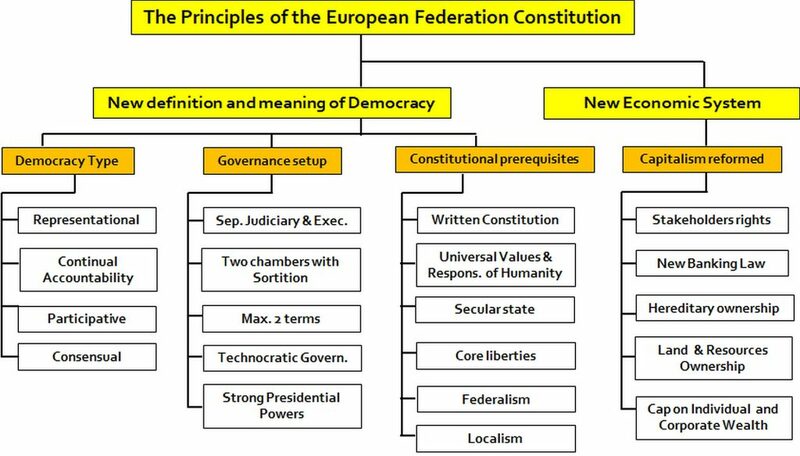 At the core of the European Federation Constitution are Universal Values of Humanity and the principles of Consensual Presidential Democracy. Just to remind you, such a Constitution would come into force not right now, but by about 2030, when EF might become a single state. I would also like to stress that this is in not a draft of the future Constitution but rather a proposal for the content of key articles of that Constitution based on Consensual Presidential Democracy, as my input to a debate on such a Constitution. I have summarized the principles of the Constitution in the chart below. Therefore, the main articles of the Constitution of the European Federation laid out below are really just the headlines, proposing what such an article should contain, with some justification, rather than how it should be precisely formulated. My comments are in italics. A Judaeo-Christian culture is accepted as a unifying culture underpinning the culture of Humanity, while ensuring other cultures to flourish, as long as they do not undermine the homogeneity of the common culture. (To avoid even much bigger internal tensions than it has today, Europe cannot risk cultural tensions on a grand scale. That would be the worst outcome for everyone and I am writing about it in the last chapter. People change very slowly their mentality, and acceptability of entirely new norms of behaviour and inter-racial and multi-cultural relationships One generation would not be enough to achieve a reasonable social cohesion. Therefore, in such a difficult transitionary period, the EF must minimize social tensions and ensure that the its culture remains as homogenous as possible). Non- hereditary system of governance (so that all Constitutional Monarchies in Europe, such as in Spain, Belgium, the Netherlands, or in the UK, if it stays in the EU, would have to be converted into Republics and the current monarchs given a special, non-constitutional role, e.g. National Hereditary Governor or a similar title, effectively as a permanent minister). The member states of the former European Union decide to become a federated state called the European Federation (EF). The system of governance applied in the EF is Consensual Presidential Democracy. European Federation Association Area (EFAA), which is also known as Zone 4. Legislative powers are split into two Houses of the Parliament: the Lower House and the Senate. The Senate is split into two chambers: the Senators Chamber and the Sortition Chamber. (Ensures among others continuous verification that the laws are passed for the benefits of all and not just the majority and that the elected representatives are held to account not just during elections but throughout the whole term of the Parliament). The government acts in the interest of all citizens and not just those one supporting the largest party. It achieves that by reaching consensus with the minority parties on decisions made (and thus ending the ‘tyranny of majority’). Greater decentralisation of some powers. The EF repatriates some of the existing powers vested in the EU institutions back to regions and even to a lower local level, significantly strengthening the local democracy. (This is similar to the Swiss and Scandinavian models). Greater centralisation of some powers. The EF strengthens some key powers to enable effective operation of the EF as a federal state. Foreign Affairs Minister selected from MPs by the President (The former EU members will no longer carry out their own foreign policy. However, to smoothen the transition period after joining the EF, over the first year of the EF membership, the EF’s Foreign Affairs Minister will be shadowed by the member state’s Foreign Affairs Minister). Internal Affairs (Home Office) Minister selected from MPs by the President. The main function of the Internal Affairs Minister will be to co-ordinate EF-wide policies, so that former EU member states will have almost the same powers as before federalization. All other existing EU Institutions and Agencies will perform its function largely as before. Parliament of the European Federation. The Parliament’s role covers passing the laws, approving the composition of the government, approving the budget, and any other decisions that would have to be voted in the parliament, e.g. in the area of defence, foreign affairs, recalling the President or MPs, etc. The EF Parliament consists of two Houses: the Lower House – the Citizens Chamber and the Senate (the Upper House), which is split into two chambers: the Representatives Chamber (50% of the Senators) and the Sortition Chamber (also 50% of the Senators). MPs and Senators can organise themselves into clubs and committees to propose new legislation. Continuity of governance is maintained, if the President is recalled in the middle of his term, by one of the two Vice-presidents replacing him by a qualified vote in the parliament. The remaining members of the Government consist of experts only. Ministers are selected by the Prime Ministers from a stand-by list of pre-approved and vetted experts. Rules on MPs expenses must be transparent.